A historic day at the Boston Marathon saw an American man win for the first time since 1983, a women’s course record set, and more than 32,000 runners return to an event marred by terrorism a year ago. Thousands more lined the course of the 118th Boston Marathon in a show of Boston’s strength as it continued its recovery from the twin bombings that claimed three lives and injured more than 260 at the 2013 event. Meb Keflezighi became the first American man to win the event since Greg Meyer in 1983, finishing in a time of 2:08:37, his personal best for a marathon. He said the crowd, and last year’s tragedy, motivated him. A three-time Olympian, Keflezighi won the 2009 New York City Marathon and finished third in Boston in 2006. He also won the silver medal in the marathon at the 2004 Olympics in Athens. 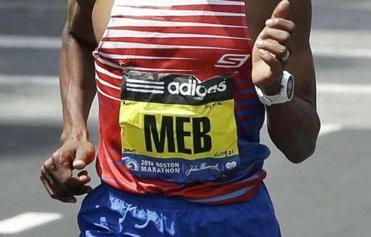 American Meb Keflezighi had the names of last year’s victims written in marker on the corners of his race bib. Meyer was the last American man to win the Boston Marathon, posting a time of 2:09:00 in 1983. American Lisa Larsen Weidenbach won the women’s title in 1985. Meyer embraced Keflezighi at the finish line not far from where two deadly bombs terminated last year’s race. Separating herself from the lead pack with a long and punishing stride, Rita Jeptoo of Kenya became a three-time winner of the Boston Marathon, flying to the finish in a course-record time of 2:18:57. Her time was 1 minute 46 seconds faster than the previous course record of 2:20:43 set in 2002 by Margaret Okayo of Kenya. It was Jeptoo’s second consecutive Boston victory. She won last year’s race in 2:26:25. Officials said 35,755 runners started the race in Hopkinton on an ideal spring morning, a year and a week after the 2013 race. Ernst Van Dyk returned to the winner’s circle for a record 10th time. The 41-year-old South African won the men’s wheelchair division with an unofficial time of 1:20:36. Van Dyk led from start to finish, capturing his first Boston victory since 2010. Tatyana McFadden made her 25th birthday a winning one, successfully defending her women’s wheelchair title. McFadden, who won last year’s race in her Boston debut, scored her second win in impressive fashion. She pushed past Tsuchida Wakako of Japan near the halfway point, and kept on building her lead. McFadden – the only person ever to sweep four big races in a single year (London, Boston, Chicago, and New York in 2013 – won a silver medal in Sochi at the Paralympic Games earlier this year, then defended her London Marathon title last week. John Powers can be reached at jpowers@globe.com.Michael Whitmer can be reached at mwhitmer@globe.com. Follow him on Twitter @GlobeWhitmer.Michael Vega can be reached at vega@globe.com.